On my last day in Italy, I returned early to the marina shopping area for breakfast – another sweetbread and tea. I had a plan to find my missing bags of gifts. I knew I had them at my last stop yesterday: the Internet spot. My hopes were pinned on them being there I.It would open around 10:00 a.m. So I took advantage of the time offered me to make a second round of purchases. I bought different items just in case I found the missing bags. Again the merchants were helpful. I think I did a better job this time around. I had just enough time to check out of the hotel. As I was gathering my stuff at the hotel, I heard a woman’s loud voice but didn’t understand a word except “Senore”. I looked outside and saw the owner’s wife holding up my lost bags. I didn’t care what else she was saying. She handed me the bags, and we both beamed big smiles. I had left them at their place last night when I was looking for my room. Thanks God for having these nice folks looking out for me. With all my stuff in tow, I returned to the dock area to finish my time in Salina and to enjoy a nearly ideal day. Since it was Sunday, the activities were more subdued. I looked to the west and saw a striking cathedral. The road there looked easy enough to maneuver, but two things held me back: I had my bags, and I was not dressed properly for church. Yeah, it matters in Italy. The vendors in the square and the mingling tourists kept thing interesting enough. There were many Europeans vacationing on this island. One day in Santa Marina Salina gives enough of a quality experience. You can do everything there unless you want an adventure like diving or mountain climbing. I was ready to get back home, but I’ll always remember Salina, Sicily fondly. The hydrofoil arrived, and we boarded. I tried to capture another good seat but not this time. People from all of the islands are storming back to Milazzo on the few remaining vessels. Back in Milazzo, I found the trip to the train station was more than I could walk. I went to the first cab in line and made a deal for 12 euros to the train station. I got the typical white knuckle trip cabbies here are so good at providing. The train ride from Milazzo to Messina was one to try my patience. The train was an hour late. I first boarded an empty car but was followed by a conductor. He told me I was on the wrong car and to follow him quickly. He lead me to a jam packed car. My only place to stand was at the door between two cars. I wasn’t too concerned since the journey will be short. Before long, I learned the conductor enjoyed pushing the door – and me – to get through. After the second time, I decided to educate him. As he approached the door, I’d open it toward the car to avoid hitting me. When he returned, I did the same thing. One more time, he caught me unaware and pushed the door on me. I did my version of flipping out. I shoved it back on him denying him access. He finally relented, and I opened the door towards him. I said, “The door swings two ways.” I held the door for him and smiled when he left, but that was the last time I saw this guy. Hope I didn’t scare him off. I departed the train gratefully at Messina and realized I had not only developed a bad attitude but risked losing all the mellow I had banked while in Italy. I would not let this happen. After breathing exercises at the nearby Victor Emmanuel memorial, I got it back. Even a later bad scrape with the natives at the snack bar didn’t bring me down again. I realized I was ready to get back home. My last nerve was too vulnerable to access. The trains back to Rome airport brought me to the next way station of my journey without notice. I had time to find that elusive good meal before the plane. I wandered around their idea of a food court. It was all the same stuff: paninis and pizza. No, I wanted a meal. I knew in a week I’d be jonesing for one of these snack food items, but I had reached my limit. Then I saw it. Long glass counters with real food displayed. I asked the counter clerk how I could buy that food. She pointed me to the counters. I stood there for 10 minutes trying to engage the women working there. One was at least kind enough to shoo me away. I never did find out who got that food, but there was a conspiracy to keep me from it. I boarded the plane and settled in for the ten hour flight. My seat had a malfunctioning DVD player. I asked for a change of seats, but there were none left in economy class. Okay, you can’t break me. After touchdown in Philadelphia, I had to deal with an unusually large number of travelers going through customs. The officials did a stellar job keeping us moving. They even kept their sunny manners. My remaining traveling went well or I was too numb to notice from nearly 35 hours of being on the road. I befriended a German businessman who was trying to get to a Walnut Street hotel. I told him to stick with me. I guided him to the entrance to Walnut Street and wished him well. All that was left was the train back to Downingtown. The cars were packed full, but a man begrudgingly moved his computer from a seat so I could us it. Afterward, he’d aggressively shake his paper and avoided my eye contact. My plan was to call Lyn from the train station phone, but I found a empty space where it had once been. I walked home to my waiting wife. It was good to be home and filled with new memories. After the train ride from Palermo to Messina, it was a short walk to the ferry docks. My plans would have me in Salina around 3:00 p.m. Please let me find a good restaurant at mid-morning. That didn’t happen. I grabbed yet another panini with vino at a snack bar. Messina got a bad review from The Lonely Planet. It was described as void of any interesting areas for those on holiday and bit too commercial. That may be true, but I didn’t see it. It has large piazzas where people gather. Some are eating; some are playing and some are just talking. There is a snack shack nearby and enough pigeons to establish it as a park. The people are friendly and helped me understand my bad Italian is really bad Sicilian. They’d make me say their words three times to be sure I got it. I didn’t. With the morning fading, I stopped at an umbrelloni for the usual vino rosso and light snack. The waiter was straight out of central booking. He was 60ish, elegant and costumed to a tee. He took my order in one sweeping motion and blended into the cafe. He fetched a huge wine glass of the region’s best red. I watched him as he ply his trade. He controlled the area with a deft touch. No one wanted for anything for long with him on patrol. Strangers would ask for directions, and he’d provide them kindly. I spent an hour watching the activities around the hotel. The time passed by comfortably. Launch time drew near, and I returned to the docks. I didn’t follow the crowd descending into the boat’s lower reaches to be near the bar. Instead I went to the bow area and found the best seat on the boat: front row with a huge window. 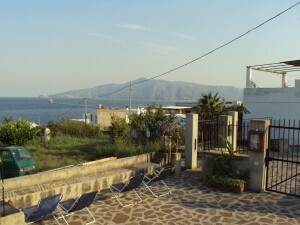 Three hours of skipping along a cobalt blue sea and Santa Marina Salina, the former fishing village framed the horizon. With transportation done, finding a room was next. I walked to the dock’s central gathering area and started reading signs. In a short time, a short, rotund man approached me and said something I thought was about a taxi. No, I said. I want an albergo (hotel). That was what he was offering me. I made one condition; I must be able to walk from the room back to the dock. “Si, he said. 15 minutoes by promenade”, but he rather drive me there in his macchina (car). Nope, I insisted I want to walk there. After one round of “addiamo”, we were off. The 15 minute promenade was uphill followed by up mountain. The last leg of the walk was steep enough to make me wonder if stopping might cause me to fall backwards. I then noticed this round, little man was not having any problems with the walk while I was sucking wind. At last ,we arrived at his property. He gave me the tour and insisted I see the view from my balcony. He was right to do so. The Mediterrian Sea framed the nearby island of Lipari. With an about face, I had expansive view of the mountain created by an ancient volcano. All this along with a fairly nice room for a mere 25 euros. The last leg of the walk. The walk back to the dock area took less than five minutes since it was all down hill. I joined the loungers near the sea with my glass of the native wine called Malvasia, Young men were kicking a soccer ball around and doing it quite well. I asked about fotbol on the island and was told there were no fields. My question struck a humorous vein. Maybe because the island is a volcanic rock mountain. I was advised to shop today because many of the stores are closed Sundays. I threw myself into the task since I was out of time for such things. Lucky for me the stores had really cool stuff and people to help. My last stop was the local Internet spot to get Lyn caught up on my adventures. I decided to stow my purchases back at the hotel and then find a restaurant. Back at the hotel, I couldn’t remember which room was mine. I walked past the ones with keys and tried mine in two locks that didn’t open anything. I had made conversation with the neighbors earlier so I sought them out. We went to the owner’s home and learned which one was my room, and he led me to it. Grazie, amico. Time to dine. I changed into my version of evening wear and then walked down the first hill to a charming outdoor restaurant. It was 8:15 p.m., and there was no one eating. I asked the stylishly dressed waiter for a table. “No, senore. Must have reservation.”, he said. I again looked at all the empty table, and decided it’s his loss. Near the dock area, I followed a sign for the ’nni Lausta restaurant, but it led me into another damn shack shop. Wait one; painted on the wall was a sign pointing upstairs to the restaurant. I’ve learned the hard-to-find restaurant are often good. I returned to the narrow street area and had my last drink of the day. The stores closed their doors as couples strolled in the mild night air. All that was missing was some concertina music. Too soon it was time to go back to the hotel. At the hotel, I packed for tomorrow’s 10:00 a.m. check out. A search of the room did not uncover where I had put the bags of gifts. No need to panic yet. I decided to retrace my steps tomorrow, and hope to find them there. Worry was something I learned was usually a waste of time. Traveling by train from Italy to Sicily means crossing the strait separating them. I was told this may be done with barges, and I looked forward to this experience. The trip from Rome to Palermo is twelve hours and skirts the Mediterranean Sea. At about hour seven, we hit the Strait of Messina separating Italy and Sicily. Our train stopped in what looked like an underground station. After about two hours, our train rolled again, and we were in Sicily. I neither saw nor felt anything like being transported by barge. Oh well. 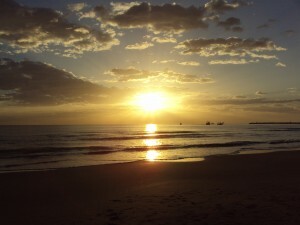 After the usual unsatisfing sleep that comes with traveling, I watched the young morning come alive. Palermo was another three hours by train. During this time, I applied my thoughts to a second stop in Sicily, and I found it. A volcanic island in the Aeolian archipelago named Salina (Sa lee na). It’s spelled the same as wife, Lyn’s Kansas hometown of Salina but out there they say Sa lie na. I admit this was a real reach, but the more I read about this isle, the more it sounded ideal. I also reasoned I could find that soccer uniform for Jackson with Salina on it. It would involve a lot of travel time but what the heck. My plans now were to stay in Palermo for one day and then ride back to Messina for the hydrofoil ferry to Salina. I’d stay in Salina for a day and then start the arduous journey to PCO airport and America. At the Palermo station, I made a decision to stay near the station so I could easily make the next train to Messina tomorrow. Finding a hotel was no problem even if overpriced at 72 euros. One hot shower later, I’m on the mean streets of Palermo. I took a compass reading when I left and settled in for the long haul. Palermo is a storied city described as having many historical sites, i.e., cathedrals, memorials. It was as advertised. I found an intersection with towering cathedrals on all four corners called Quattro Canti. They were a portal to the religious section of Palermo. I made plans to return tonight to visit more sites. To avoid getting really lost, my walking pattern was to make right turns every 15 minutes. In Palermo, this meant trips through the food district, upscale shopping centers, commercial areas and finally the dredges of the city along some nasty river. After all this walking, I had circled back to the train station. In search of a decent Sicilian meal, I returned to Quattro Canti and beyond. I imagined, if I walked around enough, I’d see the other sites and get a meal. My giddy side came out at the Palermo Cathedral. It was awesome! This site took up an entire square block. The structures were highly ornate and seemed to drip with history. After running back and forth around the block, I had taken a large number of photos many of which were deleted after I calmed down. If they would have left me inside, I may still be there. In this region, there was also a thriving art community. 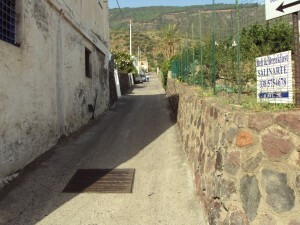 The narrow streets were difficult to maneuver with the wares lining them. I was drawn into one store by the ornate details on such items as Vespa scooters, dog carts and wagon wheels. The artist covered every visible inch with some colorful design. The artist/owner introduced himself. I told him I was traveling far too light to make an art purchase. No problem he said; I could support his work by having my picture taken in one of those “insert head here” displays for a small donation. Four euros later, this is what I got. I walked the artsy area for a while and found a charming restaurant in what looked like an alleyway. The waiter offered me a table and menu. He then disappeared into his laptop. It is easy to order a meal in Sicily; just go for the seafood choices. On a brilliant Palermo night, I had an awesome three course meal with a glass of Nero D’Avolas I didn’t know it then, but this would be the next to last good meal I’d have in Italy. 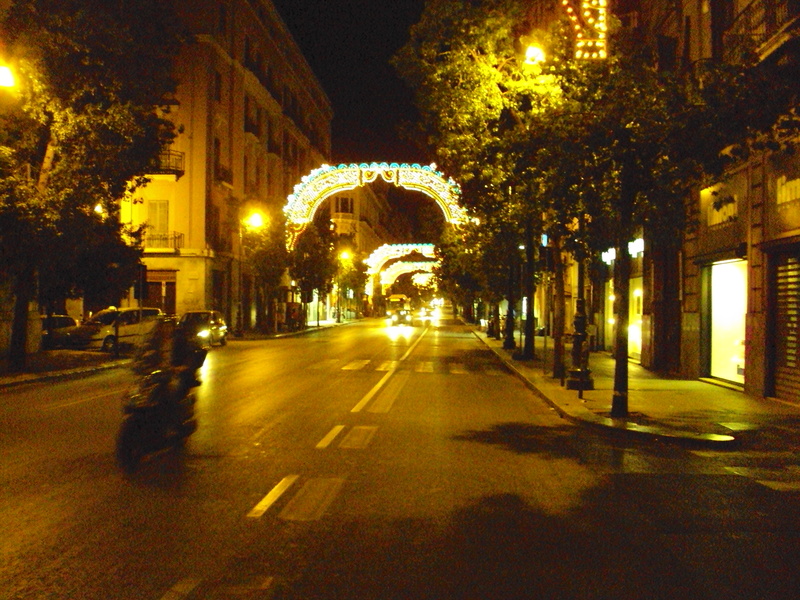 Palermo at night disguises the grim of its streets with colorful arches making everything look nearly storybook-like. After another umbrelloni stop, I returned to the hotel to pack for Messina and Salina. Our gang of seven breakfasted at the Hotel Don Juan before splitting in three different directions. I would train to Palermo, Sicily; Anthony & Iris are returning to America and Bernie, JoJo, Barb & Michael had Florence and Venice in their sites. At breakfast, we talked about the previous days and our immediate plans. I was quizzed about my reasons to visit Sicily. I explained it was a region of Italy I had not yet visited, and it sounded interesting. Where in Sicily? Probably Palermo but maybe elsewhere. I said my goodbyes and bon voyages to them. I would need to check out of the La Vela Albergo and catch the train back to Rome. Francesco was doing his day job: medical doctor so I had no chance to say my good-byes2 to him. This left time to visit my cousin, Bernadine’s cousin, Massimo at his local gelateria. The directions lead me to the heart of the tourist section in Giulianova. 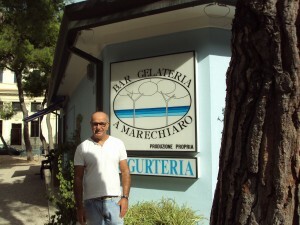 He had one of two great gelaterias on opposite corners. They were the best ones in town and competitors much like Geno’s and Pat’s in South Philly. It was late morning, but they were still serving up a lot of that good gelato. I asked the gal behind the counter if Massimo was here. She said Massimo is her father and right there. I waited for the chance to talk with this man. With the usual question, “Parla englise?” came his response, “No” and he pointed back to his daughter. I slipped into pidgin Italgish complete with body gestures. “Cugina Bernadine Mascherino en America?’ He shot back, “Si, me cugina e Bernadine Mascherino en America.” My next clumsy attempt came out, “Bernadine says ‘Hello’; Bernadine e me cugina”. He tapped both our chest and said, “Bernadine cugina” He got the message and the greeting part. I circled in for the requested photo. “No problem”, came back in clear English. We found a spot near his sign, and I got the money shot Berni asked for. Massimo then went all Italian on me and tried to feed me. “Sono un diabettico” let him know of my sensitivity to sugars. He face showed sadness. I sensed it would be better to let him return to his customers, and we had a warm parting. This was a fun check off of the “ to do” list and anything for Bernadine. Buying the train ticket became a battle of wills with the ticket agent. He said he spoke no English which is fair since I am in his country. I asked for the ticket to Roma Termini. He took my 14 euros and handed me a ticket to Roma Timburtina. I knew from the ride to Giulianova that this station is one short of Roma Termini. When I challenged him on this, he said, in English, this ticket will take me to my final destination. His expressive gestures told me he was done with me and to move along. More on this later. My experience with Anna schooled me well. I was able to switch trains at Pescaro with no problems. The scenery going back to Rome was just a repeat of the trip up. I spent most of the time reading about Sicily. These readings presented Sicily as a more amped up version of Italy. I’m sure I’ll find plenty things of interest once there. Back to the train ride, when I arrived at Roma Timburtina, I swam my way through an endless stream of commuters going the other way. I found a ticket agent and showed my ticket. Could I catch a train to Roma Termini with this? “No”, he said. My mind flashed back to the clerk at Giulianova. He knew full well I’d be one station short with the ticket he sold me. What a jerk! It was a 1.5 Euro subway ride to Termini, and I was there in plenty of time to catch the Palermo nightly express. I became some Korean guys traveling friend which seemed fair to me. I could help a fellow traveller since I had had so much help. In Rome, I settled in to wait out the four hours until the train leaves. Enough time to eat and walk around the area again. Back at the station I found a spot with other travelers and away from the beggars and other ne’er do wells. Note: for safety sake, do not wait alone. Also spend this time making friends for the trip. The train was finally available for boarding, and I found a friendly porter to guide me to my assigned room. He slid the door open and pointed to my rack. Later I would learn he put me in the wrong section. Traveling alone in a country where I don’t speak the language always has these little hiccups. The conductor took care of the paperwork and assumed the blame for the mixup. Not everyone who works for Trenitalia are jerks. We were not yet done with visiting Campli. Word was it was the porchetta sandwich capital of the Abruzzi region. My companions didn’t want to leave without one of these renown sandwiches. The place the local DiLiugis recommended had just three rolls. We pressed on with the guidance of the local busy body, Maria who had glommed on to our party. We found a second location and picked up seven sandwiches. I opted out since pork tears me up. I’d settle there for something else except porchetta is all the location serves. Now we have eight hungry people with just seven sandwiches, but we needed a place to eat. Maria brushed us aside; ducked into a pizzeria and resurfaced. She told Anthony this pizzeria would allow us to eat there despite having purchased the sandwiches elsewhere. We gathered inside and ordered mass glasses of vino for all. I ordered pizza and watched the others dive into their prized sandwiches. On no, they were dry and tasteless. Michael DiLiugi called it the worst porchetta sandwich he has ever had. He had pizza with me. Thank goodness the wine was good. Little Maria stayed with us. She ate one half of her porchetta sandwich; we imagined the second half would be her dinner this night. We explored this small town perched on a mountain cliff. The architecture was old and impressive. We wandered around the center of town. It was Italy idyllic. The town center was rimmed by ancient building still in service as restaurants and government offices. During our wanderings, we found a shine to Mary and Jesus in a church. The below picture shows the exterior of the church. The walls and ceiling surrounding the stairs leading to it were covered with Renaissance paintings. They seemed ancient. Our day of exploration in Campli came to an end, and we motored back to Giulianova. We had mass amounts of Italian snack food and a still active jug of wine compliments of the Campli DiLuigis. Back at the hotel, we discussed the amazing events of this day and made ready to head off in different directions. Anthony and Iris would return to the Rome airport and America. Bernie, JoJo, Michael and Barb would head out to Florence and Venice. My plan was to train to Rome and then to Palermo, Sicily. P.S. : we did leave Maria in Campli. After yesterday’s visit to Teramo, our band of seven was excited for the next adventure. We were driving to Campli which is the hometown of people named DiLiugi. Our friend, Michael DiLiugi had hopes of finding someone named DiLiugi to learn if they were related. As improbable as this venture is, we all thought it would be fun to try. It didn’t take long. Just as we passed the sign for Campli, we saw another sign with “DiLiugi Dante”. It is a home improvement supply yard. It was the afternoon break time when all businesses are closed so we needed a sentry post for the wait. With the finely honed skills of Anthony Mascherino, we found a nearby umbrellonni – it’s an umbrella meant for resting tired feet and the drinking of wine. After an hour, cars started arriving at the DiLiugi Dante store. We mustered up our courage and descended on this business. Michael DiLiugi was the point man buffeted by Anthony’s language skills. Michael asked for someone named DiLiugi and displayed his driver’s license. A young man read it and started making calls. When he was done, he told us he is a DiLiugi and Dante’s son. Shortly, an older woman appeared and staked her claim as a DiLiugi even though it is through marriage to Dante. Finally a man in his 60s showed up. I could tell he was working since his clothes were covered with a white spray from cutting stone surfaces. This was the man, Dante DiLiugi. The more he listened to Anthony’s words, the more expressive his face grew. In a short time, we had created a buzz within the neighborhood. Folks came over for an explanation. One was a woman around 75 to 80 named Maria. and known as the street’s busy-body. She’s a firecracker type and was repulsed by Anthony’s attempts to kiss her. She has an aversion to mustaches, and Anthony has a beauty. Of course, he hammed it up often. Michael, Anthony and the DiLiugis got into the meat of the matter. Could they be related? Seems after some hits and misses, they do have common ancestors. Well that bit of news broke all remaining restraints. Out came the vino; there will be toasts all around. The Campli DiLiugis gave the Americano DiLiugi as much store related items with their common name as they could find. Much to Barb DiLiugi’s dislike, one was a nudie calendar. The local DiLiugis told us, the next time we come to Italy, we are to stay with them at their apartments. All this love bombing lasted about two hours. I wondered where else in the world would a business just stop because some strangers show up claiming to be related. In my America, I’d be pleased to meet these interlopers but not enough to close the store down. Maybe a meeting later that day could be worked out. It showed me that things are different in Italy. People are more grounded and easy going. Tradition has a deeper meaning. This was a magically day for us. We were with Michael DiLiugi on one of most special days of his life. On this day, we were all honorary DiLiugis from Campli, Italy. After unnecessarily traversing the mountains of Abbruzzi, we arrived 90 minutes late at our relatives’ home only to learn we were expected yesterday. Bad start. Every family has icons, and for the American Mascherinos, one is Maria Pia Mascherini in Teramo, Italy. 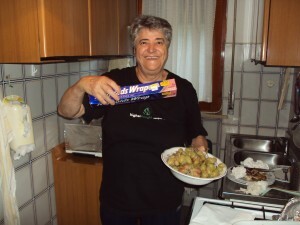 She lives in the suburb of Putignano.We would pay homage to her by visiting her home today. The seven of us assembled en masse at her front door. Door knocking had no results. We began to think she was away. The others drifted back to the street while I stayed at the door. She came out of the house and into the porch area. Her face lit up much like I imagined mine did. There were hugs, kisses and cries of “O Dieu, O Dieu”. Maria Pia looks much like she did twenty years ago. She’s a stout woman with remarkable strength – both physical and mental. Her love for us is ever-present when we’re with her. When I asked her when she will come to America – as I always do – she surprised me with “due annos – two years”. Anthony and I expected she would not ever again come to the US, but we learned both she and Vittorio plan to do so in 2014. Time to start fattening the family calf. We moved the party inside where she had prepared a small snack. It would turn out to be a full meal and probably the best we had had to that point. She offered a 95 Brunello I knew would cause my son to salivate. Yes, it was that good. We ate and drank well all the time making small talk. Maria Pia understands little English so Anthony filled the gap with his knowledge of Italian. As she always does, Maria Pia asked about our large family in America. Anthony calls it the “bon; no bon” game. Who is good and who is not. This time it was abbreviated, but we hit the high points. Maria Pia gave us all a tour of her home. It is massive, beautifully built and impeccable maintained. We viewed framed pictures of our common ancestors. Her pallor is filled with furniture made by her brother, Pierini. They are made with inlaid geometric wooden sections. All too soon our time with her came to and end. We left her home at 8:00 p.m. What did we do? We went out to eat with Vittorio, of course. After a pleasant meal with some surprising offerings, we said good-bye to our stalwart cousin. The drive back to Giulianova was uneventful and within the expected time. So much for GPSs. The early-to-bed led, as always, to the early-to-rise. 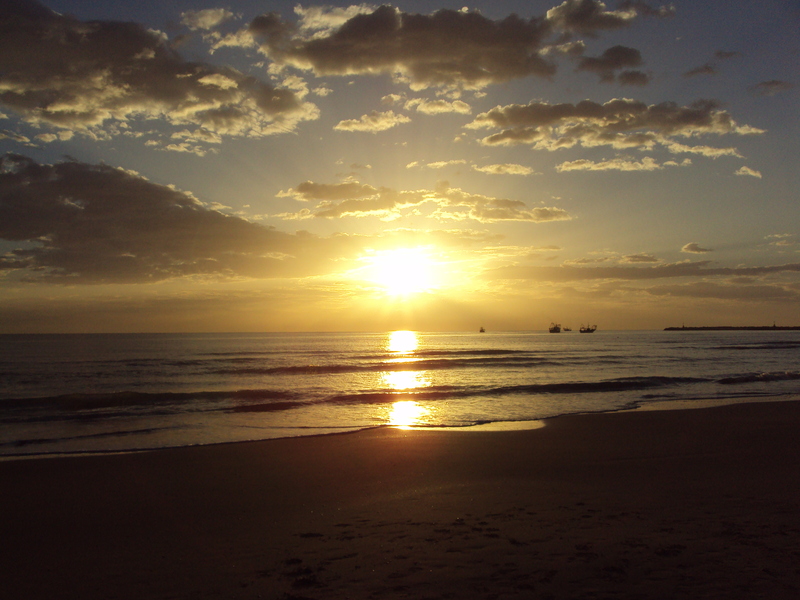 I could prepare for my day and still greet the sunrise on the Adriatic Sea. By the time I reached the beach, the workers were preparing it for today’s abuses. The section where the sand is hard and near the water break line made for ideal walking. The sun was in its early stages of rising and trying to peak through a barrier of gray. I was listening to my iPod’s playlist I call “The good stuff”. The selection shuffle seemed to follow my activity and my moods. Then The Mamas and the Papas’ version of “Dedicated to the one I love.” came on. I became aware about how much I missed having my wife, Lyn with me. Thousands of miles from Lyn I felt my love for her in a vulnerable way. It was a moment I will long remember. 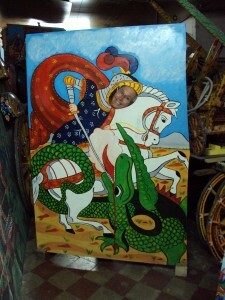 I did an about face at the Hotel Don Juan and headed back for La Vela. I passed dozens of washed up boogie boards and wondered if the owners would return to get them. Our little group had decided last night to leave Giulianova for Teramo – a 25 minute drive- at 11:00 p.m. My instructions were to wait at the La Vela to be picked up. One of the others had one of those traveler’s problems, and we got a late start. We had maps and GPSs so how could we get lost. At one roundabout, the two cars selected different exits. Phones ran, and we regrouped. When we met up, it was decided we’d follow the GPS that had proven to be more effective. Soon enough, we were on paths not much larger than one car on the edge of the mountain. We even hit a dead end at a vineyard. “Recalculating”, the GPS offered. Damn straight, lady. We kept driving on these small mountain dirt paths. It would have been easy to get testy, but the view was so pleasant, it kept our spirits up. Somehow our little band arrived at the street where my relatives live, and we grew excited to see them again. The worst part of the ride to Teramo was we lost about 90 minutes of time we could have spent with them. 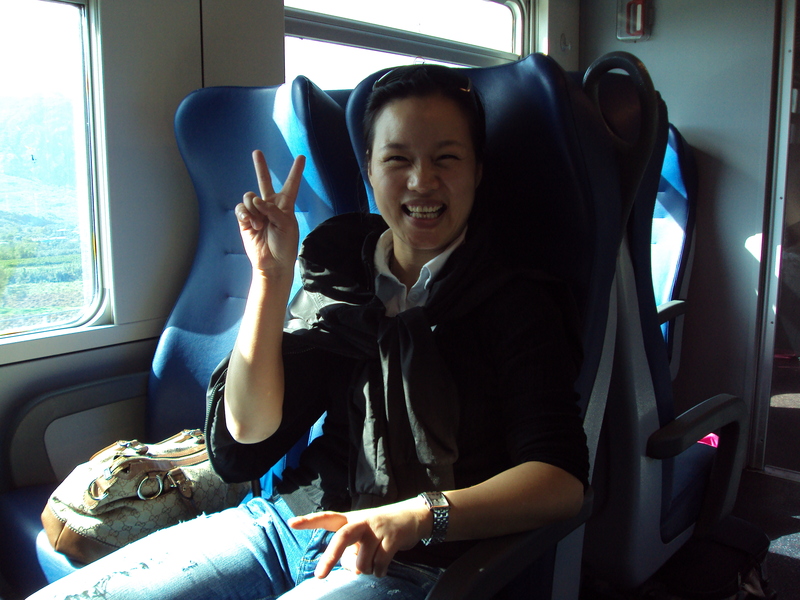 My spirits after the train ride to Giulianova from Rome ran high. I made a friend; dodged bullets making the journey and would meet up with my family and friends. Next step was to check in at the La Vela Albergo. I stayed at this combination restaurant/hotel during my last stay at the suggestion of cousin, Vittorio Pompelii. 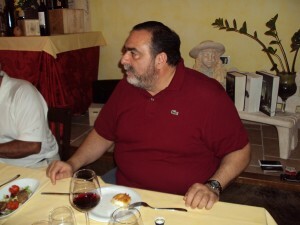 He and Francesco, the owner are friends. As I arrived at La Vela, Francesco was landscaping the palms outside the building. It was good to see him again. All was prepared for my visit. After getting moved in, I decided to go to the Hotel Don Juan where the others are booked. Today’s weather was ideal so the 15 minute walk along the Adriatic Sea was pleasant. It was one of those moments that made me glad I chose to visit Italy this time. The young man at the front desk had problems understanding the name, Mascherino, as in Anthony. After dashing about, he discovered the reservation and confirmed they had not checked in. I left a message explaining where I was with the hope they’d call after arriving. I walked back to the La Vela with enough energy to take a nap. How long I slept was undetermined, but it ended with loud knocking. It was Francesco along with my brother and sister. JoJo said, “I have never been so glad to see you”. Not understanding her remark well, I said, “Not even when I returned from Vietnam?” Bernie explained they had driven around for a long time looking for the La Vela. Since neither one spoke Italian, they just kept driving around. Tonight’s plans included dinner and fellowship. When we reached thebeachside Caprice Restaurant, I made one of my most regrettable mistakes. I kissed the men Continental style but not the women. I hope to never again to have such a lapse. They explained their plans. Tomorrow we visit our Mascherini relatives in Teramo. The following day would be a visit to Michael DiLiugi’s ancestral home town, Compli. He wants to explore the area to find anyone else named DiLiugi. We made it an early night since we all spent most of the day traveling. Note: this seaside resort town of Giulianova is at a lovely spot on the Adriatic Sea. It is clean, and the natives are friendly. The only other ingredient needed for an ideal stay would be the weather. It was clear, warm and breezy. Yes, it had all of the elements for a lovely visit to the sea. 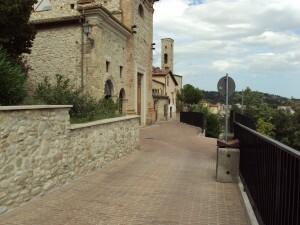 To catch an early morning train to Gulianova, I left the Hotel Galli by 6:00 a.m. Walking the streets of Rome at that hour gave me a view of the daily process used to awake this great city. There were trash pickups, breakfast stalls opening and natives bustling. The Roma Termini was as serene as it probably gets. The next task was to purchase my ticket from the kiosk. The touch screen prompts were easy to follow. Touch the English flag for english and follow the prompts. Adam and Beth would be proud of their Dad for using his techie skills internationally. No chance this happened. I swiped my credit card into the machine to buy the ticket. I kept getting a “Remove your card” audio prompt. But my card was out. Okay, with the second try, I left my card in the machine. When the same prompt came in, I removed it. The next prompt was ” Enter your pin number”. What! This card has no pin number! It’s a credit card. I cancelled the transaction and went to find a ticket teller. As I passed their first class waiting area, a crowd was merging in. I joined the merge. I waited to buy a ticket from a clerk. After some language twists, the young gal cranked out a ticket for me. She took my money; gave me my ticket and – oh so nicely – told me I was not allowed to remain in their sanctum. I thanked the clerk for her kindnesses and did the walk of shame passed the anointed ones. To travel successfully by train, I would need to keep a close eye on the monitors. My train’s track was “binario” 2 Est. I charged ahead to get there as early as I could. I followed the signs and thought, if I go much farther, I’d be out of the station. Thankfully, there was this lady conductor who seemed pleased to help folks and spoke good English. She explained I needed to change trains at Roma Timburtina and Pescaro. “How hard is that?”, I asked. “Follow the signs; it’s not hard.”, she offered. Cool. Let’s do this. I detrained at Roma Timburtina and scanned the monitors for the next stop, Pescaro. No luck. I then looked for another train employee to ask for advice. I had only ten minutes to catch the next train and grew anxious. The only working folks there were janitors. I saw them talking to a woman and took off after them. I showed them my ticket without speaking a word. They pointed at the young woman running away at a brisk pace. They made a hand gesture I translated to mean “go with her”. I did. She breezed down a ramp and stopped short at a monitor. She then bolted to a new binario. It was here where I asked if she was trying to get to Pescaro. She looked at my ticket and nodded. She gave me the “let’s go” gesture, and we did. From this point, she assumed a protective role toward me. She sat with me, and we tried to talk. Her English was as meager as my Italian. I learned we shared the same final stop of Giulianova. Pescaro is just another change trains location. My new protector is named Anna, and she is a Chinese-Italian of about 22 years of age. 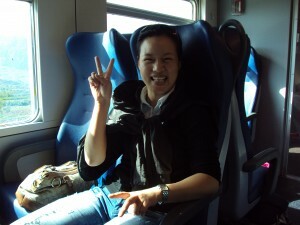 She’s traveling to Giulianova to join her fiancé’s parents. She’s nervous because she wants their approval. The time spent on the train was entertaining. She corrected my “sono poco italiano” – “I speak little Italian” to “sono piccolo italiano” – “I speak VERY little Italian”. We remarked on the changing scenery and the differences between our countries. We talked about our families and lives. We did all this with a small amount of words we both understood. We detrained at the Pescaro station and Anna led me down a level. She darted from monitor to monitor looking for the Giulianova train. He face grew concerned. She was able to convey that she took us off at the wrong Pescaro stop – seems there are two. Her best remedy was to wait 90 minutes for another to Giulianova. She was so sorry to have failed me. I told her she was my angel and all would go well. She called her waiting prospective in-laws to tell them about the snafu. It was here when I realized she was Chinese. I offered to get us food and drink for our wait. My attempt was stymied when the way out led no where with supplies. Anna and I started conversing with other travelers. It seemed my Americanism was notable to them. “Where in America?”, “Do I have family in Italy?” “Do I like Italy?’ were typical questions. A little boy seemed shy around me. I took a peanut candy bar from my backpack and handed it to Anna. I told her to give it to the boy and tell him it’s from America. The little ones eyes’ lit up. His momma green lighted the gift. They both seemed amused by the strange markings on the candy bar. Following this, the boy tore into it. The whole waiting at Pescaro experience made me feel more like a visiting ambassador. To show my thanks to Anna for her help, I gave her the coin pouch I purchased for Jo-Anna D’Adamo. I told her I considered her my Angel this day. She liked it and smiled. We caught the Giulinova train, and Anna grew more pensive. She was concerned her fiancé’s parents would be upset with her for making them wait and extra hour and a half after driving six hours to Giulianova. The train arrived at Giulianova, and as I always did, I helped Anna with her luggage. On the platform, she extended her hand for a good-bye shake. She wished me well and sprinted away. I knew this proper Asian woman could not risk being seen with me by her judgmental future in-laws. I strolled toward the station and watch her head bounce away. At the station, I saw her meeting with her party. They were smiling and having a good time. I knew Anna’s concerns were behind her. I was at Giulianova at last. Time to find the La Vela Albergo and my host, Francesco. Entries (RSS) and Comments (RSS).33 queries. 2.917 seconds.